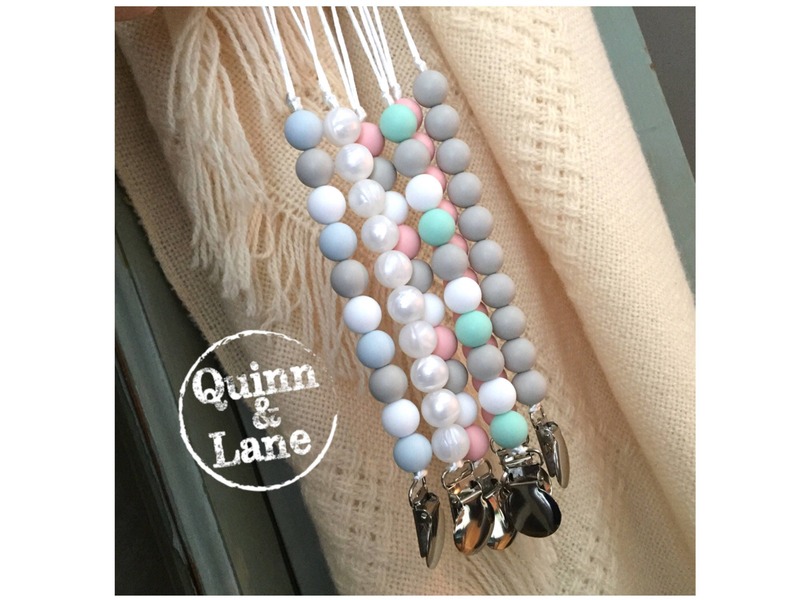 Free shipping with $27.06 purchase from QuinnAndLane. See item details below for sale terms. 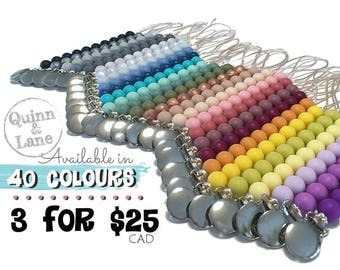 YOU pick from 40 Colours or have me create a CUSTOM "mixed" coloured one just for you! 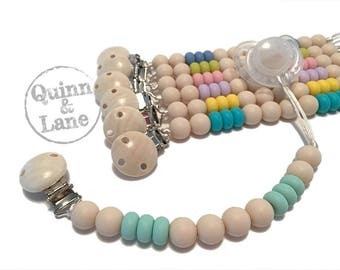 Babies LOVE chewing on their pacifier clips! Give them something SAFE to chew on that dries fast and cleans easy! 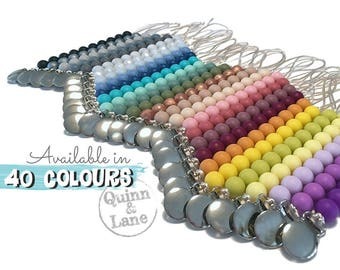 With tons of bright colours and amazing textures, their sore little teething gums will thank you! 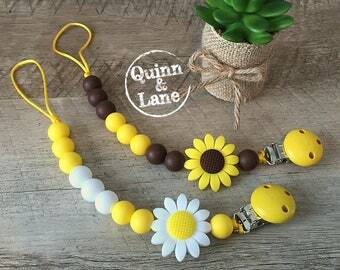 Made with 100% food grade silicone beads, SAFE for baby to chew and a super-gripping clip that won't slip or damage clothing! (2) If you want me to create a mixed coloured one just for you, please select "MIXED" from the drop down box and use the notes section upon checkout to let me know your colours and any placement directions. Be as specific as you like -- no extra charge! 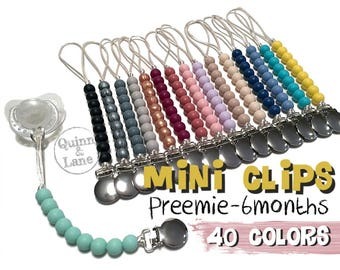 Each Pacifier clip measures approximately 10" long (measured from clip to loop end). Metal clip grips tightly to all clothing with soft silicone teeth that will not damage even the most delicate fabrics. EASY TO CLEAN: Hand wash with mild soap and lay flat to dry! PLEASE NOTE: Due to the handmade nature of this item, placement of beads may vary slightly and colours may appear different on your monitor than in person due to different monitor/screen colour calibrations. Like any other baby accessory, you should not leave your child unattended while using this product. Please ensure that either a Pacifier or one of our Silicone Teething Toys is attached to the loop end while your baby is using this product. The loop is long enough to cause gagging if taken too far into the mouth (if there is nothing attached on the end). While your baby will not choke, she/he will not appreciate the feeling of the loop end reaching far back in his/her mouth. SHIPPING: Low Flat Rate! Order as many items from my shop as you like, and only pay shipping on the first item (all other items in the same order ship for FREE)! 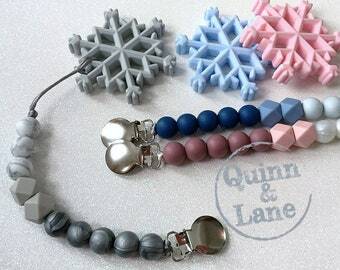 Quinn & Lane is the #1 choice of moms and their teething babies, for Silicone Teething Pacifier Clips & Soother Clips & Teethers. All my Pacifier Clips & Soother Clips & Teethers are handmade one at a time with lots of love and attention to detail. Whether you are ordering 1 Pacifier Clip or 20 Pacifier Clips, I never compromise quality for quantity. 100% Satisfaction guaranteed. 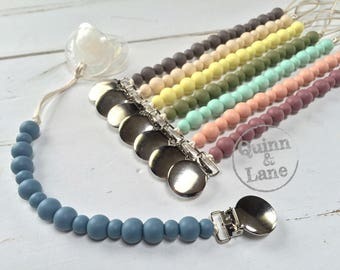 You will love Quinn & Lane Pacifier Clips & Soother Clips & Teethers - I promise -- just check out my feedback from thousands of happy moms and teething babies! FREE SHIPPING on orders over $35 CAD (approx $28 USD). No code needed - shipping will be automatically adjusted on qualifying orders upon checkout. High quality and beautiful design. Thanks so much! Great items, quick turn around for customizations and fast international shipping, thanks!